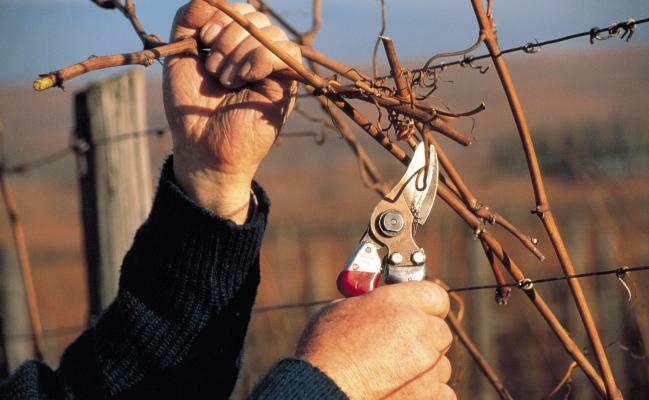 The major pruning method used in Alsace for harmonious vines is the single or double Guyot system. 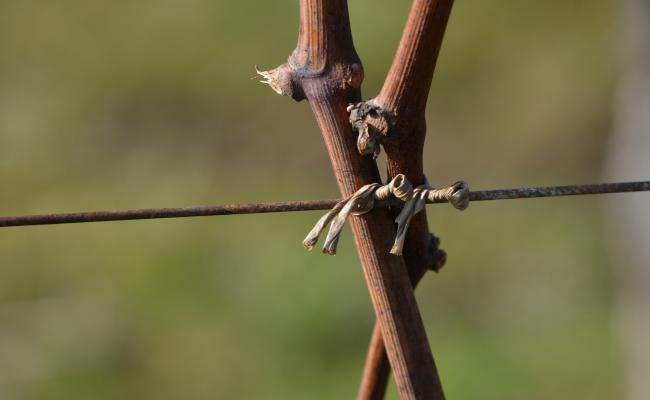 During the vegetative rest from December to March, vine-growers leave one or two varied-length vine shoots on each vine stock. Undertaken as of mid-February, this work helps the buds develop which are located at the base of long wood as well as a harmonious vertical growth distribution. This consists of removing the branches from the trunk which are not fructiferous. Their removal results in better growth of main shoots. Planting is manual or mechanical depending on the parcel layout. 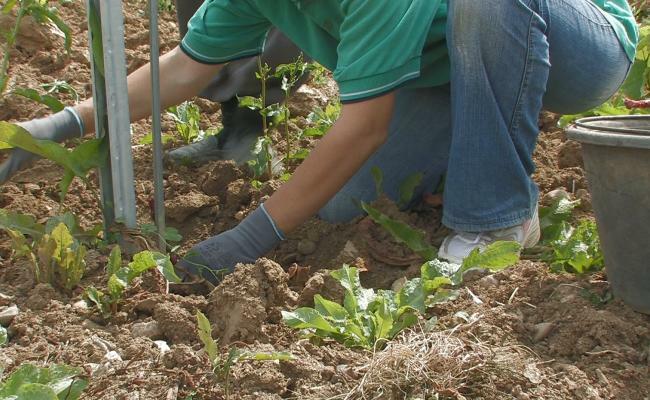 Extending from mid-March to mid-May, the planting period can vary depending on the soil condition. The latter should preferably be settled (slightly damp) down deep and dry on the surface. 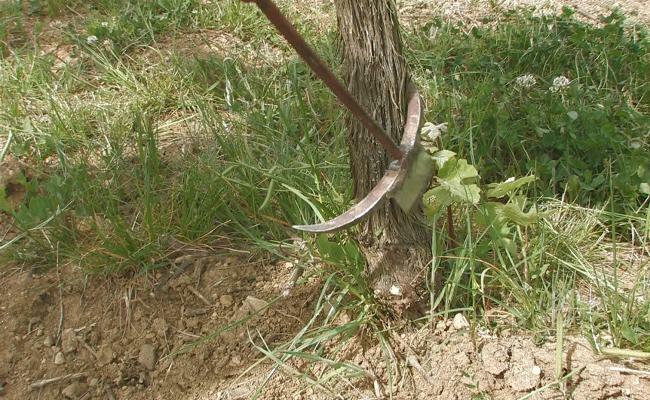 The plants used are welded grafts: on one side is the rootstock which is planted in the ground and on the other side the graft which gives the grape variety. These two wooden vine branches are then machine-grafted and placed in a greenhouse for the welding and soon the texture and roots are formed. After this, the formed plant is then planted for a year at the nursery before being sold. Trellising consists of positioning the branches upward, holding them in place between two pairs of wires. Trellising facilitates the trimming, aiming at cutting the growing-branch ends so as to form a straight row. This work takes places from mid-May to July and is increasingly undertaken using machines, as opposed to the thinning which is done by hand and consists of removing the leaves located near the bunches to increase their sun-intake and decrease the risks of being affected by grey rot. This aims at maintaining the plant production potential at a maximum, fighting against diseases and parasites. Examples of the most frequent diseases: powdery mildew (whitens the branches and berries). The seeds begin to burst as they grow. 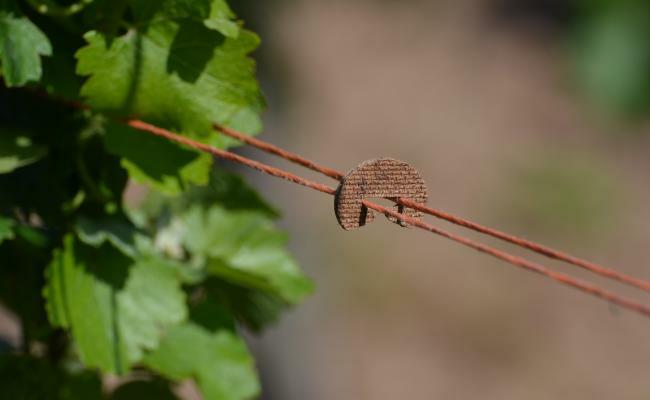 Powdery mildew greatly damages the grape bunches as it dries them out completely. The leaves can be attacked and reduces their photosynthesis. Grey rot is a parasite which seriously changes the grape: the berries are covered in a grey powder. The bunch worms (butterfly larvae) make holes in the skin which helps grey rot to develop. There exist ever-growing ecological methods to fight off these diseases and parasites. For example using sexual confusion which limits insecticides. 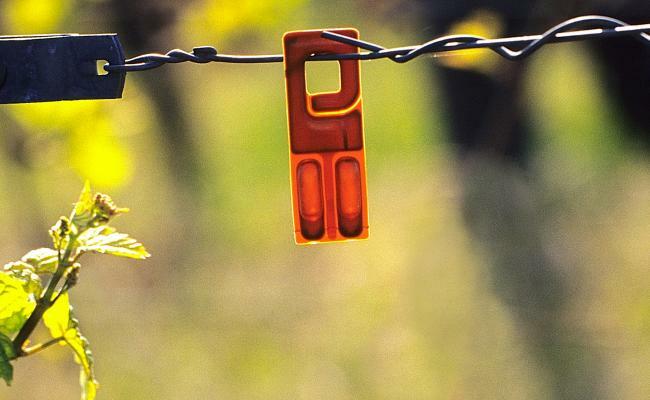 Capsules diffusing female butterfly pheromones are placed around the vineyard which misleads the males. This results in less mating and therefore the risks of grey rot are decreased by two. The current trends are aiming for natural vegetation management (ENM). This technique consists of allowing natural flora to grow in the ground and to manage it using foliar herbicides or crushing when the vegetation reaches about 20 cm. This advantageous technique of controlled grassing-over provides the benefit of developing a diverse cover of vegetation that retains the soil and water which limits the nitrates in autumn and winter. It starts around mid-August (veraison stage during which the berry skins start adopting their definitive colour) and extends over a period of about 45 days. The grape sugar content progresses whereas the acidic level decreases. Around mid-September, the leaves still present around the grapes can be removed to diminish the risks of rot with an optimum sunshine on the bunch. The dates for harvest for each AOC are defined by a Prefectoral order. They begin when the grapes are ripe, when they have the best sugar/acidity ratio which is generally 100 days after the mid-flowering stage. 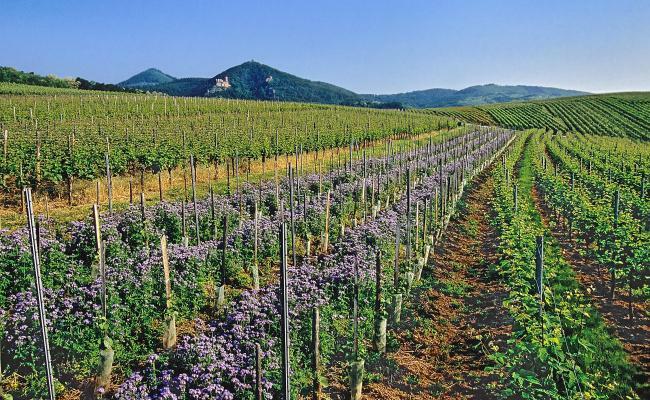 It’s the varieties used to produce Crémant d’Alsace which are harvested first, around September 15. Then follow the grapes for AOC Alsace and AOC Alsace Grand Cru. 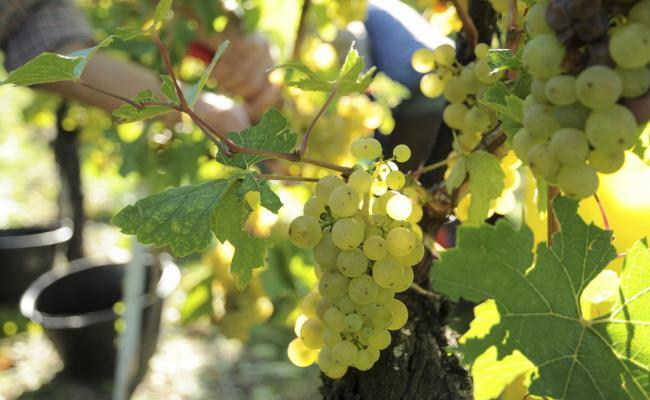 It’s only around mid-October that harvesting starts for varieties used to produce Vendanges Tardives and Sélections de Grains Nobles. Harvesting is still mostly done by hand and requires about 250 hours per hectare making over 30 people to pick 1 hectare in one day. 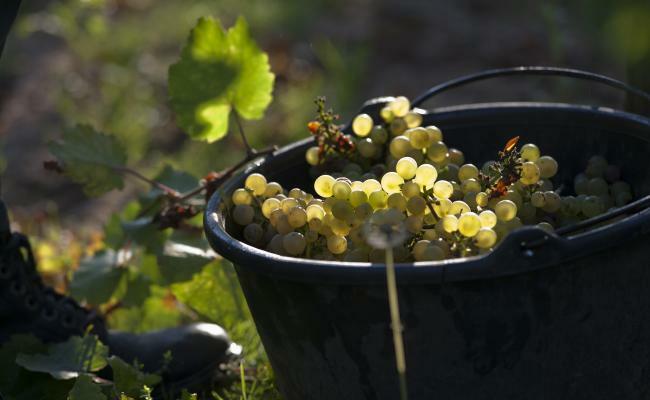 Transporting the harvest from the vineyards to the cellars is done using either vats or harvest bins (called bottiches in Alsace). Before being pressed, the grapes are stripped (except for the Crémant, Vendanges Tardives and Sélections de Grains Nobles) then pumped into the press.